Ready to go completely paperless? Lifehacker’s favorite portable scanner brand is back with the Doxie Go Wi-Fi scanner, offering all the convenience of earlier Go models plus Wi-Fi capability so you don’t even need a computer on hand. It retails for $230, but Lifehacker readers can get it for over 25% off with code LHDOXIE - the lowest price on the web. It’s 2015, so if you still have piles of paperwork, old photos, and mementos cluttering up your desk it’s time to go paperless. 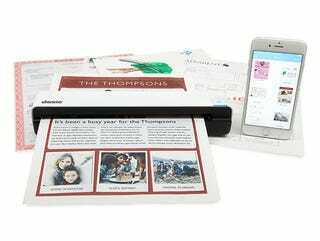 Doxie Go Wi-Fi makes it super easy to digitize all your paper, and create organized, easy-to-navigate catalogues. It’s slim and portable, and with Wi-Fi capability you can remotely scan documents and sync to any of your devices. For just $165 (use code LHDOXIE), you’ll get the Doxie Go Wi-Fi scanner, access to the Doxie apps (compatible with Mac, Windows, and iOS), and everything else you’ll need to start scanning right away. Shipping is included to the US (just $15 more to ship worldwide), and will take 1-2 weeks to arrive. Interested? Get yours at the link below.